Wendy Tran submitted this photo and caption. Bill Borges too this photo of me and my friend Scott marching off the field with our "xylos" after the Kingsmen Invitational on Aug. 8, 2007 just two days before the big show on Aug. 10 when the Kingsmen Alumni Corps performed at the DCI World Championship Semifinals. 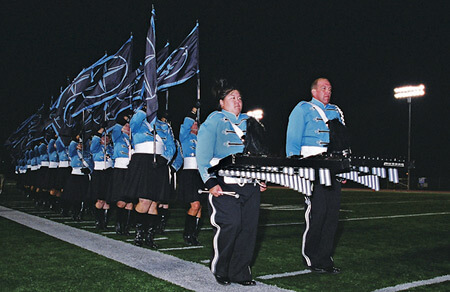 The Kingsmen Alumni performance from the 2007 DCI World Championship Semifinals will be included as part of Drum Corps International's spring cinema event, "The Countdown," on Thursday, April 24, 2008.